John Boehner’s announcement of his resignation may have come unexpectedly to some. For one, President Obama commented that he was surprised at Boehner’s resignation. Although they certainly had their disagreements, President Obama still described the former Speaker as “a good man” and a “patriot.” However, the truth may be that many secretly suspected such an event would occur. Rumors were circulating that Boehner was planning to announce his resignation on his birthday. His resignation may be a sign of how divided and disoriented the Republican Party currently is. Nancy Pelosi, a House Representative for California, stated that Boehner’s resignation was “a stark indication of the disarray of House Republicans.” In 2010, Republican Party members elected Boehner to House Speaker, hoping he would prevent any undesirable bills from being passed. Although he is also conservative, Boehner took a different approach to matters than his fellow party members. He tried to be more diplomatic in his dealings with the Democratic Party. Needless to say, his fellow Republicans didn’t like this. They thought Boehner needed to crack down on Democratic bills. This fall, Boehner was attempting to avoid a government shutdown, but received more opposition from Republicans due to his actions. According to nytimes.com, the Republican voters said they would definitely not support any government budget funding Planned Parenthood, and this ultimatum put Boehner in a difficult position. Of course, all of this has had an effect on the current Republican presidential campaign as well. Several of the candidates, such as Marco Rubio and Ted Cruz, have expressed disapproval of House Speaker Boehner, saying that he was too lenient with President Obama’s proposed bills. Boehner has received a lot of negative attention lately, but, looking at his history, he really exemplifies the American dream in numerous ways. Boehner described himself as a “…a regular guy with a big job.” He largely grew up outside of the world of politics. Born in Ohio, he grew up humbly in a Catholic family that had 12 children. He was the first in his family to attend college and earned his bachelor’s degree in administration from Xavier University. Boehner’s rise to serve as Speaker started as a member of the board of trustees of Union Township in Butler, OH. Subsequently, Boehner became a member of the Ohio House of Representatives. After that, his rise to being a powerful Congress member (eventually leading to his becoming Speaker) began. 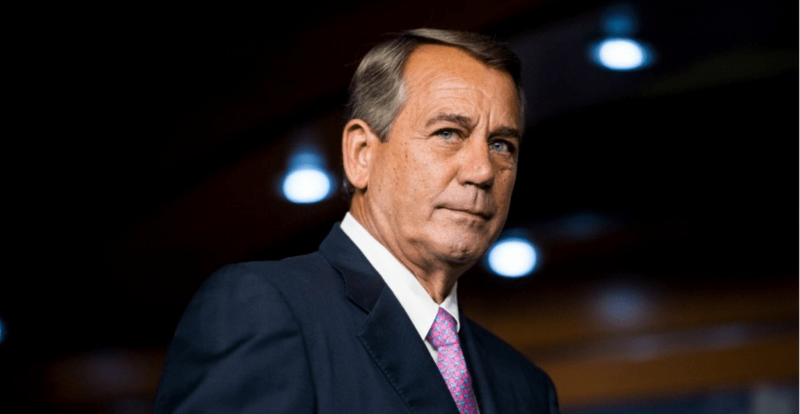 Boehner has served as the Speaker for about six years. He stated that if he stayed in office he felt it would “…do irreparable harm to the institution.” As the House Speaker, Boehner’s first goal was to protect the institution. He formally announced his resignation on September 25, 2015. Boehner will be resigning officially at the end of October. As of now, the popular candidate for House Speaker is Kevin McCarthy, a well-liked House Representative from California. Viewed more favorably by conservative members, Kevin McCarthy will hopefully be able to unite the Republican Party members once again.